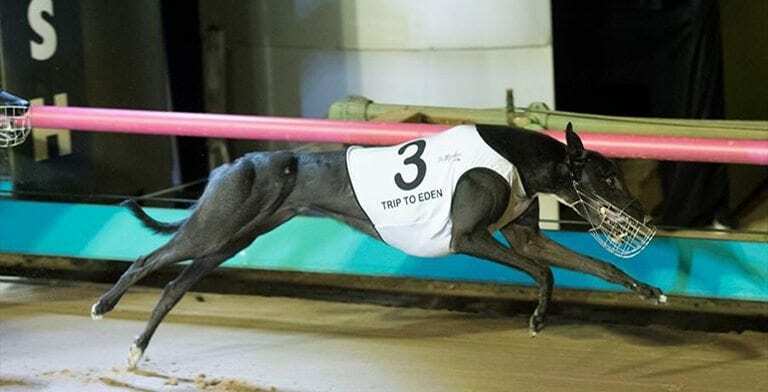 CENTRAL Coast enthusiast Stephen Connor has no reservations declaring Trip To Eden the best dog he has owned after the three-year-old greyhound won the Group 1 Association Cup (720m) at Wentworth Park on Saturday night. Stepping from box three, the Seona Thompson-trained greyhound exploded from the traps, leading all the way over South Australian rival Bogie Bekim (box two) to score by two and a half lengths in a fast 42.02. It was an uncharacteristic display from the son of Solve The Puzzle and Key To Eden which normally stalks the pace before unleashing a powerful finishing burst, with Connor conceding he was surprised to see his charge leading in the early stages. “I was expecting him to be out the back early and I was just hoping he wouldn’t be too far out the back – so when he came out in front I was shocked,” Connor told Australian Racing Greyhound. “It made me a little bit worried as well because he can reel off some really quick sections and sometimes when they jump in front they can burn themselves out a bit. Trip To Eden has now won 18 of his 42 starts with 13 minor placings, including eight of his last 12 race track appearances. Amongst his victories was another group 1 triumph in the Super Stayers at The Meadows earlier this year, with his prize money earnings now in excess of $290,000. However, Connor says his black chaser has always flown under the radar. “He is an incredibly underrated dog – he has got to be up there with the best stayers in the country and he has proven that now on multiple occasions. “I don’t know why he is so underrated – one of the leading tipsters didn’t even have him in his first four for the Association Cup. Connor said the 30 kilogram racer has always shown plenty of ability. “He always looked as if he was always going to run at least 600m so he went up to Grafton last July for the middle distance race throughout their winter carnival. “He was only a baby, but he won his heat and got beat by [Nangar Thunder] in the final – after that run he got sent straight to Jason, but I think the run flattened him and took the edge off him a bit. Trip To Eden’s success on the track is especially rewarding for Connor who bred and owned his group winning dam, Key To Eden, which is by his brilliant multiple group winning racer-turned-sire Suave Fella. Connor said he has been refining his line for more than a decade in an attempt to get a greyhound as good as Trip To Eden. “Nowadays with what’s gone on you have got to breed dogs that have got strength and chase and he has got both of them in spades,” he said. “It’s taken me a while to breed the type of dog that I wanted, but he is the real deal this bloke. “He is the best dog I have had – we’ve had some good fun with our dogs over the years, but this bloke is pretty much bulletproof. “Even if he misses the kick he is still a chance of winning – he can lead and come from behind and he smashed the track record at Traralgon a few starts back. Connor is looking forward to using Trip To Eden as a sire when his career comes to a close, but having just turned three years of age he is hoping there is still plenty of fun to be had on the race track. “He turned three last week so he should still have eight to 12 months racing if we do the right thing by him. “He will have a short let-up now and then he will go after the Sandown Cup next month – after that race he will probably have a decent six week break.